As a playwright Moss Hart (1904-61) is most famous for his collaborations with George S. Kaufman (1889-1961). The Shaw Festival presented the duo’s 1930 play Once in a Lifetime in 1988 and revived it the next year. 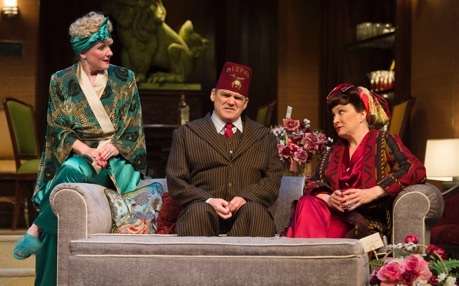 It presented their 1936 classic comedy You Can’t Take It with You in 1999. And it presented their near-absurdist play of 1939, The Man Who Came to Dinner, in 2001. In 2002 the Festival presented Stephen Sondheim’s musical Merrily We Roll Along (1981), based on the team’s 1934 drama of the same name. After 1940, Hart wanted to prove he could write a successful play without the help of Kaufman, known as “the great collaborator”. One of these solo efforts is the 1948 comedy Light Up the Sky, a play about a first-time playwright and the show people who put on his play at an out-of-town tryout in Boston. Having staged so many of Kaufman and Hart’s works, it is only natural that the Shaw Festival would want to stage Hart best-known play written without Kaufman, but the result is a disappointment. The play is filled with caricatures instead of characters and the running jokes and payoff lines are never as funny as they should be. The overall impression is of a second-rate comedy with an overly familiar plot that takes two acts to warm up before it hits its stride in its third act. The action is set entirely in the suite of actress Irene Livingston (Claire Jullien) in the Ritz-Carlton Hotel in Boston. The plot is very simple. In Act 1 show people associated with Livingston or the new play she will appear in gather in her suite for pre-opening toasts. This act allows Hart a rather over-extended exposition where we get to meet the nine primary cast members including Peter Sloan (Charlie Gallant), the humble first-time playwright and former truck-driver and odd-job man from Appleton, Wisconsin. Overwhelmed by the time and money they have invested in staging a play he wrote only for himself , he concludes, “These people are good in heart – they have the wonderful courage of dreamers and fools. And there’s not too much of that around”. In Act 2, in ones and twos the same characters return from the opening depressed by what they perceive as an unmitigated disaster. All the praise and hope they expressed in Act 1 they unsay in Act 2 and their viciousness turned on each other and on the playwright causes Sloan to decide to flee Boston and never write again. After intermission we have Act 3 that takes place in the early hours of the next morning. A noisy Shriners convention has kept most people awake all night. When the reviews appear in the papers, the show people suddenly have to revise their plans and try to undo what damage they did in Act 2. Although the main characters are all based on famous theatre people that the audience of 1948 would have recognized, to us the characters appear merely as a collection of stereotypes from virtually any play or movie about the theatre. Besides the requisite self-involved grande dame of the theatre embodied in Irene Livingston, Hart gives us the great actress’s harried secretary Miss Lowell (Fiona Byrne); Carleton Fitzgerald (Steven Sutcliffe), the emotional director of the play; Sidney Black (Thom Marriott), the uncultured producer of the show; Frances Black (Kelli Fox), his even more vulgar wife; Peter Sloan, the timid newbie playwright; and Owen Turner (Graeme Somerville), the ever-calm reigning playwright of the age. These plays always have a wise-cracking older woman who has seen everything innumerable times before. Sometimes its the grande dame’s maid. In this case it is her mother Stella (Laurie Paton). Normally, in this kind of play the leading actress would have an equally over-dramatic actor for a husband, but here, for a change, the leading actress’s husband is a mousy stockbroker Tyler Rayburn (Kelly Wong). This is because Irene Livingston is based on Gertrude Lawrence and her businessman husband Richard Aldrich. The trick in directing a play like this is to try to turn the caricatures back into at least slightly rounded characters. Director Blair Williams and his cast are only partially successful. Claire Jullien, who has been turning in some wonderfully subtle performances in her seven years at the Festival, unaccountably goes way over the top as Irene Livingston. It’s the kind of role where excess is the danger. The problem is not as much that she indulges in it as that her indulgence is so unvaried. She starts out so big she has nowhere to go. She takes the approach that Irene is always acting whatever she does. That means she never takes advantage of the occasions when she could allow us to see the real woman beneath the façade and thus give some depth to the character. Irene has, after all, married a non-theatre person like Rayburn and Jullien should help us see why Irene needs someone like him. Another major surprise is Kelli Fox as Frances Black. Fox, who has played so many intense, highly intelligent women at the Festival, obviously relishes the chance to play a ditzy blonde for a change. She shows she could do it well but she tries way too hard to be funny. If only she could tone down her voice and mannerisms by several degrees, we might be able to think of Mrs. Black as a real person instead of a live-action cartoon. After all, Frances really isn’t as dumb as she seems since she does recognize another potential backer when she meets one. The third surprise is Steven Sutcliffe as Carleton Fitzgerald. Like, Jullien and Fox, he also starts out way too big. It doesn’t help that Hart gives him a tagline about about crying as his standard reaction to anything. It isn’t that funny the first time we hear it and it becomes quite tedious by the twentieth. Sutcliffe has to show that there’s more to Fitzgerald than the emotional puddle he seems to be. Otherwise, how could he be considered an effective, much less great director? The one actor who get the tone of the comedy just right is Laurie Paton as Irene’s mother Stella. 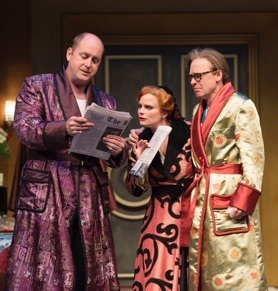 It must be admitted that Hart has given her all the good lines in the play, but the lines would not work if Paton did not know how to deliver them with the perfect note of dry wit. Having seen everything before, Laurie gives Stella an unflappably wry view of the world that helps balance the excesses of the other characters. It would be good if Hart had let us in on how Stella views the everyday theatrics of her own daughter. As the loudmouth producer Sidney Black, Thom Marriott does head over the top now and then, but fortunately he reigns himself in. We have to see why a wealthy man, who has previously traded only in silver and paintings, would be so overwhelmed by Sloan’s play that he would risk becoming a first-time producer and sink $300,000 into in. Marriott makes it clear. The ordinary guy in Sloan says something that speaks to the ordinary guy in Black and Black is in awe of a man, who unlike himself, has such a command of language to say such important things. Like Paton’s Stella, Charlie Gallant’s Sloan feels like one of the few real people on stage. He moves from his initial humbled taciturnity to outraged volubility when he finds that the people he trusted can so easily turn against him. The one problem with his performance is why he thinks people from Wisconsin should speak with a Newfoundland accent. Fiona Byrne does the best she can with her role as Irene’s secretary Miss Lowell even if her scene starts the play off on the wrong foot since it involves her trying to cope with a talking parrot. Byrne’s character exists purely as an expositional device since each newcomer has to explain to her who he or she is. More interaction between her and Gallant’s Sloan would have been good since it turns out that Miss Lowell is one of the few who understands Sloan’s play. Graeme Somerville as the great playwright Owen Turner, Moss Hart’s alter-ego, is primarily a symbolic figure representing the glory of the theatre, yet Somerville manages to give him a believable human dimension. Kelly Wong’s Tyler Rayburn is meant to fade into the woodwork, but it’s rather too bad he does, because we’d like to know how he manages to be happily married to such a hyperdramatic person as Irene. Probably, the most authentically funny scene in the play is the intrusion of Shawn Wright as the Shriner William Gallagher into the room. Wright has his naive character express such a sincere love of “thee-á-ter" that it helps to put all the hyperbolics of the other characters into perspective. Light Up the Sky is an unsatisfying comedy, happy to present stereotypes of what theatre-people are like rather than create more realistic characters, with a simplistic plot that moves towards a too-easy resolution. The Festival should not yet give up on Moss Hart. Toronto Operetta Theatre proved in 2006 what an engrossing musical Lady in the Dark (1941) still is that Hart wrote with Kurt Weill and Ira Gershwin. But for a more complex behind-the-scenes look at the lives of people hoping for careers in the theatre, the Festival should turn to Stage Door (1926) by George S. Kaufman and Edna Ferber, a play with a nearly all-female cast that the Festival has not yet produced. If Katherine Hepburn, Ginger Rogers, Lucille Ball and Eve Arden could shine in the 1937 film version of it, the stars of Shaw Festival could certainly shine in it today. Photo: Charlie Gallant, Claire Jullien and Thom Marriott; Thom Marriott, Claire Jullien and Steven Sutcliffe; Kelli Fox, Shawn Wright and Laurie Paton. ©2015 David Cooper.